Did you know that music can actually scare you? Really, we are not kidding you! Yet, its not so much music but sounds of a particular frequency that can send shivers down your spine. In this article, we will tell you what’s it all about and how you could use such creepy Halloween sounds for your party, haunted house event, or porch haunting. As mentioned, it’s not the music itself that can make you feel anxious or nervous. It’s all about the frequency of different sounds. These findings are closely related to science’s attempt to explain supernatural sightings, mostly of ghosts and other spiritual figures. That certain frequencies can create a feeling of uneasiness and anxiety – the symptoms typically associated with fear and likewise described by people that claim they had seen a ghost – was explained by engineer Vic Tandy in the 1980’s. Tandy had been working in his laboratory one evening when he felt uncomfortable, seeing grey shapes and schemes from the corner of his eyes. 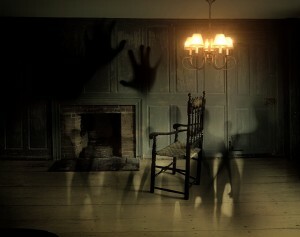 Upon his investigation, however, he noticed that a broken fan was responsible for this supposed sighting of a ghost. How was this possible? The broken fan created a noise that could not be perceived by the human ear. The range of human hearing begins at a frequency of 20hz. Sounds below that frequency cannot be heard by us – but it seems like we can nevertheless feel them. Tandy’s broken fan produced a sound with a frequency of 19hz which caused him to break out in sweat, dizziness, discomfort, and even a blurred vision. Other investigations around supposed haunted locations also revealed that the air contained sounds of a 19hz frequency, causing the people present to experience a feeling of fear or even panic. In other researchers, these deep sounds have been described as so-called “infrasound”. Some researchers suggest that infrasound can be found in different environments, produced by winds, storms, some earthquakes, and even animals to repel predators and foes. Thus, it is highly likely that natural phenomenons around supposedly haunted sights can cause these feelings connected to fear. And it could also explain why these feelings do not arise in every person that visits a haunted sight. Not every human is responsive to infrasound in the same way or at the same frequency. Likewise, the source of the sounds with frequencies below 20hz could not be constant, like winds for example. Can Music Cause Ghost Sightings? One may believe in these explanations or not, but how does sound explain ghost sightings or other supernatural phenomena? The explanation could lie in the nature of sound. Sound is nothing more but vibrations that travel through the air. If you ever stood close to a speaker or been in a car with loud music on, you have most probably felt the vibrations of the music on the car’s dashboard or in front of the speaker. This shows that it is possible for sounds to move objects or make them vibrate. Creaking doors, puffed out candles, and the movement of cloths and fabric when it’s windless can be explained by these vibrations of infrasound. In addition to these objects, we humans can be “moved” by these vibrations as well. Vibrating eyeballs cause dizziness and blurred vision, and can likewise result in the sighting of ghost-like schemes. Whether you want to believe this explanation for supernatural sightings or not, many types of research suggest that low-frequency sounds can induce fear. However, not only such frequencies can send chills down our spines. Musicians and especially movie score composers tend to play with our feelings with their songs and compositions – and they know how to induce fear as well. Instead of inaudible frequencies, they use sound effects that can very well be heard by humans. Screams, chain rattlings, high pitched noises, echoed, whispering, creaking doors, solitary footsteps, thunderstorms, and groans – the list is endless. All these sounds are associated to fear and being scared, to threats and creepy occurrences. Thus, their usage in horror film scores or Halloween music is rather popular. If you want to induce fear into your guests at your Halloween party, choosing musical pieces or background sounds that cause such effects will set the perfect creepy mood. In case you have no possibility to create 19hz sounds at your party, try exposing your guests, friends, or family to some horror ambient sounds. ‹ What Made Humans Invent Music?